"9/11 indelibly altered America in ways that some now fear have put the government's counterterrorism strategies of domestic surveillance and data mining on a collision course with the Fourth Amendment." A commentary from correspondent Hedrick Smith. A casino security room in Las Vegas, Nev.
"So many people in America think this does not affect them. They've been convinced that these programs are only targeted at suspected terrorists. … I think that's wrong. … Our programs are not perfect, and it is inevitable that totally innocent Americans are going to be affected by these programs," former CIA Assistant General Counsel Suzanne Spaulding tells FRONTLINE correspondent Hedrick Smith in Spying on the Home Front. 9/11 has indelibly altered America in ways that people are now starting to earnestly question: not only perpetual orange alerts, barricades and body frisks at the airport, but greater government scrutiny of people's records and electronic surveillance of their communications. The watershed, officials tell FRONTLINE, was the government's shift after 9/11 to a strategy of pre-emption at home -- not just prosecuting terrorists for breaking the law, but trying to find and stop them before they strike. 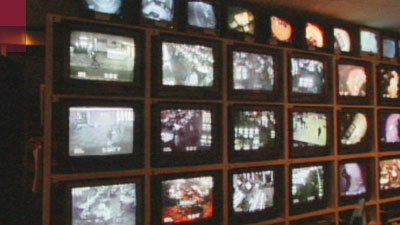 President Bush described his anti-terrorist measures as narrow and targeted, but a FRONTLINE investigation has found that the National Security Agency (NSA) has engaged in wiretapping and sifting Internet communications of millions of Americans; the FBI conducted a data sweep on 250,000 Las Vegas vacationers, and along with more than 50 other agencies, they are mining commercial-sector data banks to an unprecedented degree. Even government officials with experience since 9/11 are nagged by anxiety about the jeopardy that a war without end against unseen terrorists poses to our way of life, our personal freedoms. "I always said, when I was in my position running counterterrorism operations for the FBI, 'How much security do you want, and how many rights do you want to give up?'" Larry Mefford, former assistant FBI director, tells Smith. "I can give you more security, but I've got to take away some rights. … Personally, I want to live in a country where you have a common-sense, fair balance, because I'm worried about people that are untrained, unsupervised, doing things with good intentions but, at the end of the day, harm our liberties." Although the president told the nation that his NSA eavesdropping program was limited to known Al Qaeda agents or supporters abroad making calls into the U.S., comments of other administration officials and intelligence veterans indicate that the NSA cast its net far more widely. AT&T technician Mark Klein inadvertently discovered that the whole flow of Internet traffic in several AT&T operations centers was being regularly diverted to the NSA, a charge indirectly substantiated by John Yoo, the Justice Department lawyer who wrote the official legal memos legitimizing the president's warrantless wiretapping program. Yoo told FRONTLINE: "The government needs to have access to international communications so that it can try to find communications that are coming into the country where Al Qaeda's trying to send messages to cell members in the country. In order to do that, it does have to have access to communication networks." Spying on the Home Front also looks at a massive FBI data sweep in December 2003. On a tip that Al Qaeda "might have an interest in Las Vegas" around New Year's 2004, the FBI demanded records from all hotels, airlines, rental car agencies, casinos and other businesses on every person who visited Las Vegas in the run-up to the holiday. Stephen Sprouse and Kristin Douglas of Kansas City, Mo., object to being caught in the FBI dragnet in Las Vegas just because they happened to get married there at the wrong moment. Says Douglas, "I'm sure that the government does a lot of things that I don't know about, and I've always been OK with that -- until I found out that I was included." A check of all 250,000 Las Vegas visitors against terrorist watch lists turned up no known terrorist suspects or associates of suspects. The FBI told FRONTLINE that the records had been kept for more than two years, but have now all been destroyed. In the broad reach of NSA eavesdropping, the massive FBI data sweep in Las Vegas, access to records gathered by private database companies that allows government agencies to avoid the limitations provided by the Privacy Act, and nearly 200 other government data-mining programs identified by the Government Accounting Office, experienced national security officials and government attorneys see a troubling and potentially dangerous collision between the strategy of pre-emption and the Fourth Amendment's protections against unreasonable search and seizure. Peter Swire, a law professor and former White House privacy adviser to President Clinton, tells FRONTLINE that since 9/11 the government has been moving away from the traditional legal standard of investigations based on individual suspicion to generalized suspicion. The new standard, Swire says, is: "Check everybody. Everybody is a suspect."